1878: San Francisco's changed from a Gold-Rush era boomtown into a bustling city full of money, Victorian-style bawdy houses, and a loose sense of the law at best. Enter Matthew Slade. Formerly the Pinkerton Detective Agency's best gun-hand, investigator, and tracker. 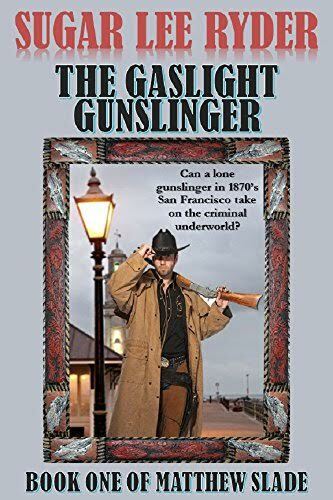 No sooner does he arrive at San Francisco's stockyard than he rescues Mai Lee, a little Chinese girl, from a pair of thugs intent on kidnapping her. Slade finds out that the girl is wanted by Huang Sun, the leader of the dominant tong - a Chinese crime syndicate that runs opium dens, fan-tan parlors, and prostitution in the city. And Slade can't walk away, even if he wanted to. His first paid job as a free agent is to keep Mai Lee out of Sun's hands - no matter the cost! Can a gunslinger used to the open plains and prairies of the West deal with the criminal underworld of a crowded metropolis? Even with the help of his friend, sea-captain Amos Harding and the backing of a pair of bawdy-house madams, the odds are long at best!